For HRA Development, click here! Over the last 40+ years the Housing Authority has been involved in writing grants on behalf Cities and Counties for funding housing rehab and public facilities. Each application is competitive with other communities and funding is awarded to the community that proves the greatest need. Priorities are to preserve existing housing for owner occupied residents and repair rental units to specific standards such as energy, health and safety items. Other funds from this program are used to improve the existing sewer or to install new sewer systems, water towers and infrastructure for Small Cities that cannot afford to update their facilities without this funding. The HRA has operated various community and economic development programs since 1982. Currently, the majority of funding is received from the Department of Employment and Economic Development (DEED), located in St. Paul, MN. The Northwest Minnesota Multi-County Housing & Redevelopment Authority has received funding from the Federal Home Loan Bank of Des Moines, Iowa for homeowner rehab within an seven-county area in northern Minnesota Funding will be available to assist 35 to qualifying households in need of home repairs with a $9,000, 5-year forgivable loan at a 0% rate of interest. For more information or to see if you qualify for funding, contact us at 218-637-2431, ext. 1125 or ext. 1126. 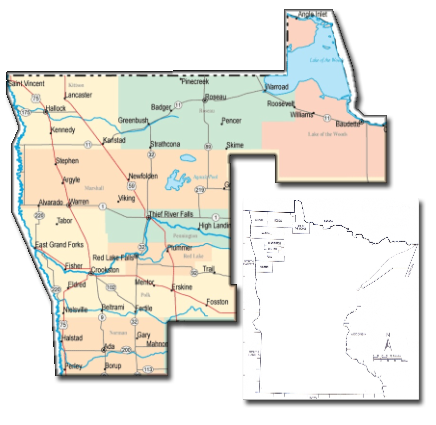 Communities in northwest Minnesota contract with the HRA to develop and submit applications various funding agencies for housing rehab or other activities.